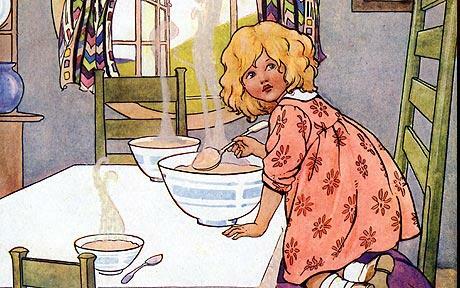 So, yeah, that Goldilocks chick was pretty persnickety, wasn't she? You guys remember her, don't you? The sassy little lass who broke into someones house and helped herself to their furniture, their food and their beds. She was on a quest for rightness. And apparently it's perfectly fine to break and enter as long as its in the name of research. She comes to mind lately as I'm seeing much in the way of this elusive search for "just right." We don't know precisely how to describe it, yet we typically know it when it we find it. When I'm reading, whether it be books or manuscripts, it's the same deal. Some works are too long, too short, too hot, too cold, too hard, too soft. For me. Therein lies the beauty of subjectivity. What's just right for me may be all wrong for you. Not such an attractive thing, really. Especially for the writer desperately seeking their publishing home. 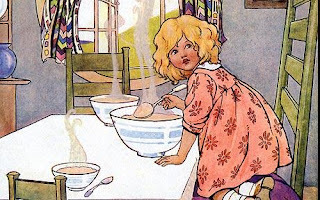 Though technically non-intruders, most authors tread carefully into the editorial houses hoping for a shot at the proverbial porridge - publication. They hope, often against the odds, of connecting with an agent or editor who will not only appreciate the fruits of their labor, but who will also deem it just right for their list. You haven't cut your writing teeth until you've been on the receiving end of the letters explaining why you were passed over. The subjectivity in those rejections can send you spinning. For example: one person may decide the work is too frothy while another may find it's not frothy enough. One may claim it lacked humor and yet another may say they'd hoped for something more serious. Yup. Spin away. Such is the way the writing world turns. It can be a challenge to decipher who or what to believe. In a sea of Goldilockses how does a writer know which one to trust? I think its a matter of finding what is also just right for you, as the creator of the work. Editorial advice can be a valuable asset but on the other side of that coin it can also bring with it intense confusion. It's at moments like this when it's best to turn to your gut-o-meter (You know all about that thingy, guys. We've talked about that one before.) Check inside yourself and decide which sage words of wisdom feel most sagey. What rings true to you?